Luke Humphreys is the February Teacher of the Month! He teaches 8th grade Math. He was nominated by a fellow staff members, Mr. Dustin Jackson, and Mrs. Haley Jackson. They both had wonderful things to say about him in their nominations! They said, “This teacher maintains a positive attitude and a passion for his students even in the most difficult times. He helps students who really struggle academically, and he would never close his door to anyone in need. Teaching 8th graders is not for the faint of heart. He impresses fellow teachers with his dedication and his tenacity to reach every student." When asking students what they love most about Mr. Humphreys, one response was, "Mr. Humphreys was truly there to teach every day. He took the time to explain things in a way that made me understand concepts that were once hard for me." Another student responded by saying, "Mr. Humphreys was less concerned about keeping a certain pace in the classroom and more concerned with actually making sure we understood what he was teaching. I really liked that about him because I never felt rushed or felt like I couldn't keep up like I sometimes feel in other classes." Clearly, this teacher puts his student's needs first and keeps their learning progress in mind! Sophia Golden is the February Student of the Month! She is a 9th grader, and the daughter of Michael and Nicole Golden . She was nominated by her History teacher, Mrs. Kim Moore, and her Dance Coach, Mrs.Janie Duvall. They said, "Sophia is such a bubbly and positive person. She has a smile on her face each day and is eager to learn. Sophia supports RJHS by participating in all the school spirit events and she shines on the dance team. She always has a kind word and is helpful to her classmates and teachers alike. She strives for excellence in all she does and her grades show it. Sophia Golden is a wonderful representative for Russellville Junior High! " 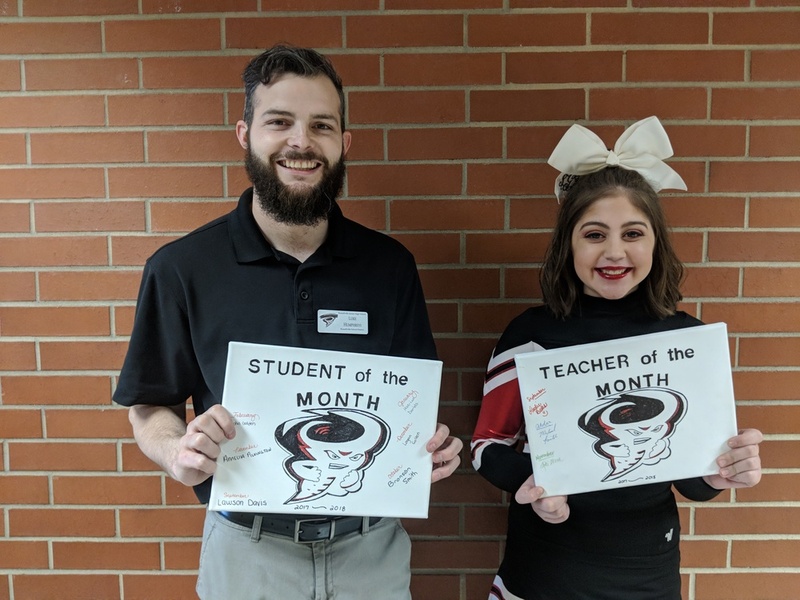 RJHS wants to say a big congratulations to Mr. Humphreys and Sophia Golden.